Wishing you all a very Merry Christmas this year from all of us at OxygenWorldwide! Wishing you all the best for the festive period wherever in the world you may be. Looking forward to helping our customers new and existing to travel and see the world, visit family and friends and make it happen. Christmas is a time for friends, family and a lot of preparing gifts, journeys, cards to send but most of all do not get too stressed and rushed and forget to look after yourself or your family’s health over the festive period. Order any repeat prescriptions you may need especially if you are going away for the festive season. Check that you have enough oxygen supply for the Christmas period. If you are going away make sure you make arrangements for any oxygen that you need. Also look out for lonely, vulnerable neighbours and friends during the winter period, that may need your help or even conversation. Stay warm during the festive time – make sure you pre-programme your heating for when you are going to be in and set your thermostat to a suitable temperature. Obviously friends or family with COPD do not just want presents all about their illness but if they have been newly diagnosed or need items replacing then you might be able to get them the perfect present. Anything that can help them with their disease will mean that you’ve helped to improve their quality of life all year round. Nothing is more important to the person who has COPD than exercise. Exercise helps build endurance and muscle strength, ultimately making it easier for your loved one to breathe. An exercise bike helps that person to enjoy exercise within the comfort of home with their oxygen nearby for peace of mind, and they can use it all year round in any weather condition, unlike a normal bike. An FDA approved pulse oximetry monitor allows the patient to monitor their oxygen levels to ensure that they are getting enough. Many patients suffer from COPD complications and may take a variety of different medications for them. A blood pressure monitor is essential to make sure the medications or the condition are not affecting their health. A nebulizer is important to have as it administers medication directly into the COPD patient’s airways to help them to breathe easier. Handy to have one when out and about so that if an attack happens they can try to reduce it and improve their breathing as a short-term tactic until they can get to their oxygen supply. Keeping warm is so very important for someone with COPD as cold air can trigger an attack and they will help to prevent them from catching any bugs during the winter. This will allow them to take their nebulizer out and about with them more easily and help to encourage them to keep themselves active. It could be used to carry other small pieces of equipment too. If they feel slightly shackled to their oxygen tank then getting them some extended tubing will allow them more freedom of movement in their home to be able to do more homely activities and keep them more active at home. A great beginner’s guide for someone newly diagnosed or their partner or carer with lots of tips and advice on how best to cope with COPD. Also if they are smokers then perhaps self-help books on stopping smoking could also be beneficial. If their local provider cant provide them with one then you can buy one privately. A portable concentrator is a hugely beneficial piece of equipment as it allows the patient to leave their home free from the shackles of their tank and use oxygen easily outside. It gives the patient a huge new lease of life and allows them to exercise, go shopping, see friends etc. without having to take their oxygen tank and supporting equipment with them. There are lots of accessories available to help improve the home for patients who use oxygen. Sometimes local providers have limited choice and availability of these neat gadgets but private companies have a vast choice of those small things that can make a huge difference. Research shows that COPD sufferers are more likely to be hospitalised during the Christmas holiday period than at any other time during the winter. This is in part due to developing respiratory infections on the weeks leading up to Christmas as the weather gets colder but also these are more easily spread at holiday social events, which are more frequent on the lead up to Christmas. With more germs around, colder weather acting as a trigger, increased social occasions and the extra stress of shopping and travelling leading up to Christmas, all increases the risk of infections, frequency of flare-ups and potential hospitalisation. Also remember that over Christmas you may not have as much access to medical assistance so preparation and check-ups before GP surgeries close and other services become minimised is very important. It is very important to take care of yourself as the weather turns colder to ensure you stay healthy throughout the winter season. Make sure your prescriptions are up-to-date so that you are prepared to treat a flare-up. Keep your medicine on hand. Watch your symptoms and get medical help if you need it. If you’re travelling, take extra supplies of your medicine. 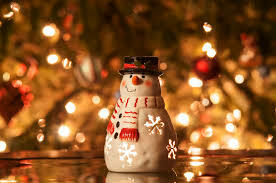 Decorations: When you get your holiday decorations out of storage remember they are most likely covered in dust. If the area where you store them has dust and mildew, proactively use your inhaler if prescribed one, and wear a mask, scarf or bandana for protection from these particles. Then wipe down all your decorations with a cloth to remove any dust before you deck the halls. Trees: Freshly cut Christmas trees are beautiful but they can also contain pollen and mould spores, which can trigger breathing problems. If you bring home a live tree for the holiday season, rinse it with a hose and let it dry in your garage before bringing it into the house. Hosting: People tend to deep clean their homes before being inundated with guests over Christmas. However excessive use of cleaning products can trigger flare-ups but there are lots of home remedies that work just as well that don’t contain chemical triggers. Scents: Holiday scents can be a great addition to the festivities but things like candles, incense and air fresheners can also be a trigger. While they smell good, they may not be good for you or your guests with respiratory challenges. Be careful of your diet, the holiday season throws up a host of rich and sugary foods but ensure you maintain a well-balanced diet as poor eating and diet can trigger a flare-up or make you more susceptible to a respiratory infection. Wear a scarf or face mask over your nose and mouth, to help warm the air before you breathe it in. Breathe through your nose, not your mouth – this also helps warm the air before it reaches your lungs. If you plan to exercise outdoors, first do warm-up exercises indoors. If need be, take a dose of your inhaler or oxygen before you go outside. If you are prepared and take precautionary measures and monitor your symptoms then you should make it through the holiday season in good health. Some COPD patients find it easier and safer to not be at home for the depths of winter to avoid ill health and chose to travel abroad to warmer climates, either with their partner or to visit friends and family. This way you can avoid the cold weather and its complications all together. Many find that being on holiday is more relaxing and the warmer weather helps to improve their health. Travelling abroad with oxygen is easy to arrange with a global company that can arrange and supply all your oxygen requirements from the second you step off the plane. Just check with your doctor that you are allowed to fly, look up helpful information on flying with COPD and contact a company, such as Oxygenworldwide who will ensure that your holiday runs smoothly. You do not want to be travelling abroad to ensure the cold doesn’t affect your health to then be faced with other problems abroad so just ensure you use a reputable company and make suitable preparations.